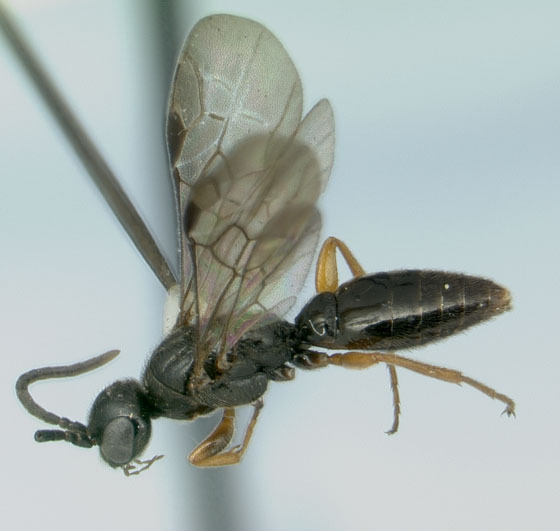 One of the "mystery" wasps I vacuumed out of the apple tree canopy as part of my MS thesis work - I've been using Borror et al 1989, and can't seem to key this one out. I originally thought Bethylidae due to dorsoventrally flattened body, head jutting slightly forward, and widened middle of femora on the forelegs. But the wing venation doesn't match at all. Nor did the wings seem right for Braconidae (due to the small costal cell). Your help much appreciated! thanks for your contributions! bring it on... we do need good pix of microparasitica -- images of preserved specimens are just fine. Looks like a male Sierolomorpha sp. They're rarely encountered, so a very good thing indeed! They often get mistaken for bethylids, but the venation is too complex for that family. There are several species in North America and I don't have a key. I have a pdf of Evans' review of the genus, plus another paper on a new species. I can send both of them to y'all if interested (do you have an email, Stacy?). Sierolomorpha canadensis (Provancher, 1888) based on Evan's key. Thanks George! Thanks all for both the kind welcome and the great ID help! This is a brand new family for me, so it's pretty exciting. George, I'll email you separately about those papers.